It would be understandable if blues veteran Duke Robillard chose to bask in the glory of his 2015 album The Acoustic Blues & Roots of Duke Robillard a wee bit longer. That album earned the talented guitarist a Blues Music Award for “Acoustic Album of the Year” amid some stiff competition as well as universal critical acclaim. Still, here we are, a year later and Robillard is preparing Blues Full Circle, his latest and greatest, for release on September 9th, 2016 by his long-time label, Stony Plain Records. Blues Full Circle was produced by Robillard and recorded at both his own Duke’s Mood Room studio as well as at Lakewest Recording in Rhode Island. The new album captures Robillard’s extraordinary guitar tone and nimble-fingered playing with a small combo, the guitarist joined by keyboardist Bruce Bears, bassist Brad Hallen, and drummer Mark Teixeira. The album can boast of some star-power guest appearances from folks like Jimmie Vaughan, who double-teams with the Duke on the instrumental “Shufflin’ and Scufflin’,” Sugar Ray Norcia from Sugar Ray & the Bluetones adds vocals to the song “Last Night,” and pianist Kelley Hunt adds some boogie beat to “The Mood Room.” Other guests appearing on Blues Full Circle include saxophonists Gordon “Sax” Beadle and Doug James. “Unfortunately, soon after, I was unable to play guitar at all for close to a year,” adds Robillard. “The months and months of physical therapy after surgery was a depressing time, but these things sometimes are clouds with silver linings, and I put myself into an art frame of mind as I dove back into photography and painting.” Robillard painted the album cover artwork for Blues Full Circle and also had an exhibition of his photography at the Van Vassem in Tiverton Rhode Island during his layoff. 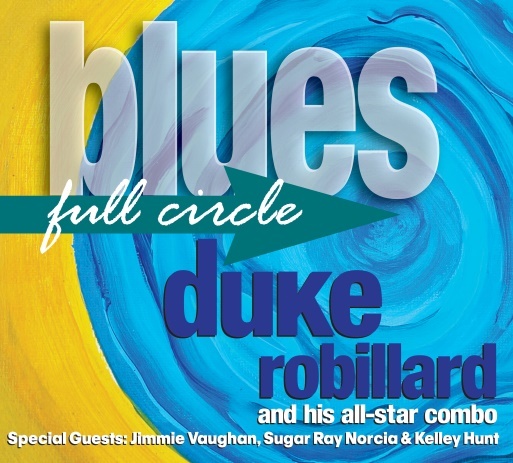 The Duke’s fans need not worry, though, ‘cause the guitarist is back and playing better than ever, Blues Full Circle a sure-fire bet for a nomination come Blues Music Awards season.